The Anvil AtlasVice has all the features you could ever want at an affordable price. Genuine full rotary function with adjustment. For hook sizes from 28-2/0. Computer machined stainless steel construction with hardened steel jaws. The Atlas's stable large format pedestal vise base and upright/angled G-Clamp are supplied as standard. Made in USA. Sold in UK. 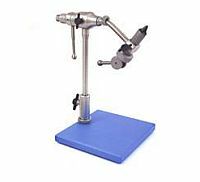 The American made Wolff APEX fly tying vise sets new standards of use ability & quality for the price. The Apex features in line rotary vice action with user friendly rotation handle, 360 degree jaw rotation for inspection and trimming, The vice has computer machined stainless steel construction, hardened steel jaws, one step hook placement with grooves in jaws, jaws hold hooks from size 6/0 to 32, material spring head, fully adjustable tilting head, pedestal base 5" x 3.25" allowing rotation and height adjustment. 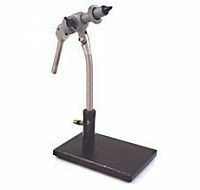 The adjustable clamp on pedestal allows for vertical or angled operation, the G-Clamp allows rotation and height adjustment,and fits surface up to 1.75" thick, Maximum height of vice is 8".